AM temp on my back porch was 59F and low humidity... Great place to eat your eggs, sausage, Dandy-Blend and grapefruit. After breakfast this dumb squirrel had to take advantage of the weather and head out to the "wasteland" again. Surprised to find 4 trailers already there on a Thursday at 8 AM. I hope somebody's working to pay my Social Security. Fished the Isle of Que today. The Que is loaded with many, many rock ledges running at an angle across the river that are now about 1-2 feet under the water. These ledges use to hold tons of smallmouth and rock bass. I floated the ledges using a small suspending rapala. No action on the rapala. Below the ledges the water drops into 6-7 feet. The old timers (older than me) use to troll this water throughout the fall and winter for walleye. 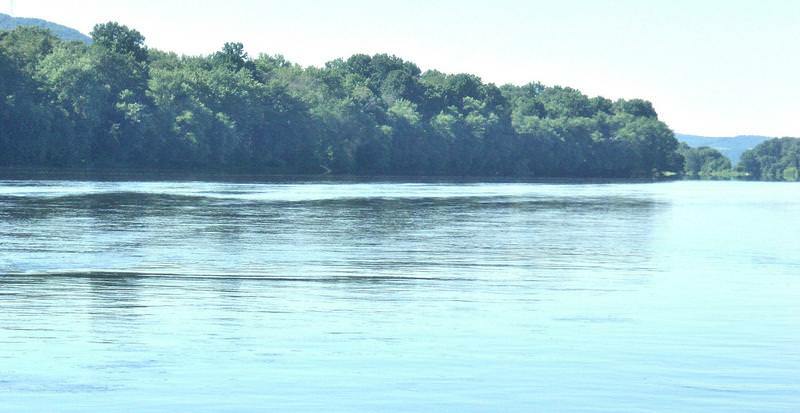 Neither the bass nor the walleye inhabit this "wasteland" like the "old days." Over 3 hours I ended up with 5 smallmouth with 16" being the best. 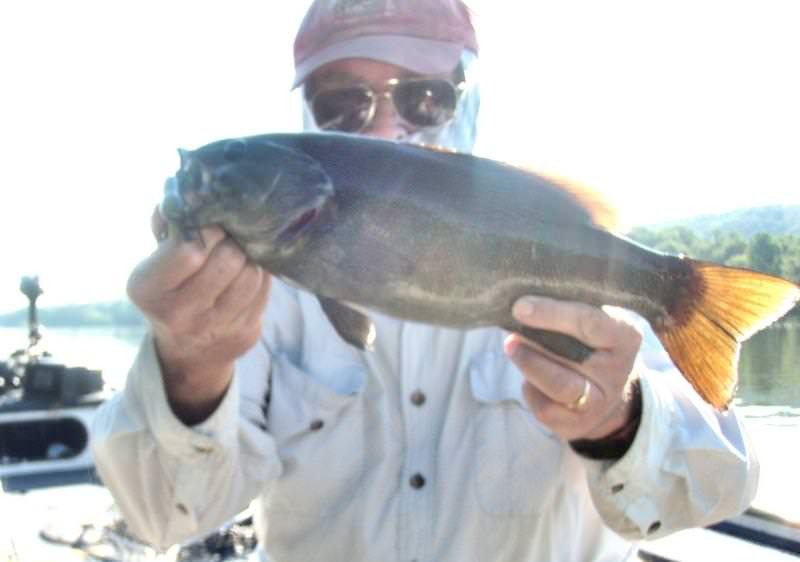 This fish rocketed out of the water 6 times. What a sight!! 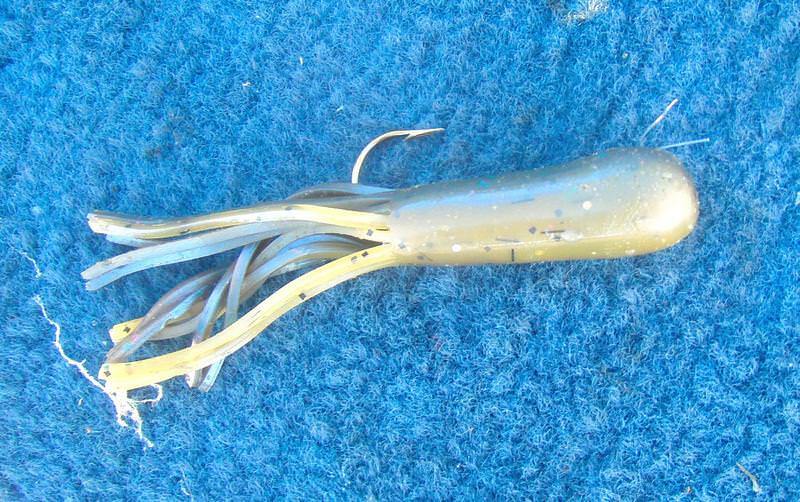 All the fish were caught along the shoreline on a laminated (bi-color) tube designed to represent a Susquehanna crawfish with a lighter tan underside and a greenish/brown top side. Have done well with this color over the years. Re: Looking for more acorns!! I appreciate the humor, the pictures and the tips on what's working and not working for you. Just wanted to say thanks. Hopefully this rain quits sooner than later and we can all get back out hunting acorns! Enjoy it. ...Just wanted to say thanks. Hopefully this rain quits sooner than later and we can all get back out hunting acorns! Enjoy it. It is going to be a while for chasing acorns. I've now got 6.5 inches of rain in my yard rain gauge over the last 48 hrs. The radar shows bands of rain continuing to come up the east coast. Gee whiz....... 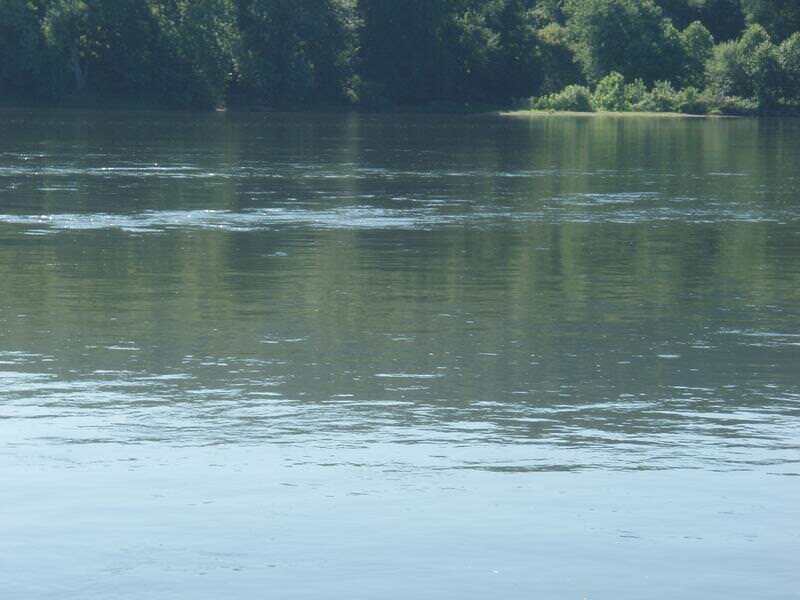 The Susquehanna is predicted to get a little over flood stage by Friday where I fish. Cleaned all my target guns this morning. I'll be at the range for the next week or so. I figured I'd try some new spots on Thursday that haven't been fished in a while. I'm going to back down the ramp to the City Island parking lot, launch off of that and fish the man made structure on the island. I think the support poles and the walls of the parking deck should hold fish, being protected from the current. Considering how the bite has been this year, this may be the best day yet. Yepper, looks like it's going to get ugly. 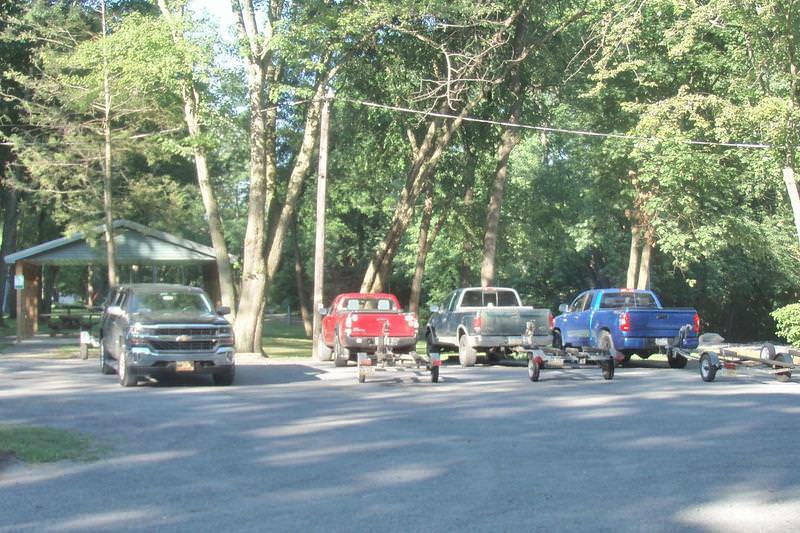 I got to find a lake to fish, wife is leaving for a week and no "honey do" list! There maybe no city island by Thursday. Or you may be able to use the top of the stands, in the ball park, to stand on and fish at you feet. When I crossed the south bridge tonight. All the boats were pulled, and the steps along the east side of the river were submerged. I don't know if I would waist the fuel. In the past 24 hours, the river has rose 6' in Harrisburg. Its at 11' at the time of this post. I see my attempt at satire passed over like the rain clouds. My ex wife always said I only marched to my own drum and still couldn't stay in step. Ooops!! I missed that bit of humor. You're planning on tying up to the ball park flag pole. No need to go to City Island. You can just launch on Front Street. Get something to imitate a rat and fish the Shipoke area. Zelmo, welcome! I like the sarcasm, I believe you may fit in.